Here are some of the most common questions we hear from our customers. Remember, no question is too small if you don’t know the answer. If you don’t see your question on this page, e-mail us. We’ll get back to you promptly. 1. Do I have to pay in advance or can I pay after the work is done? The normal time sequence is that we would contact you just before we’re anticipating being ready to ship. We would make payment arrangements then, to give your payment time for processing. We accept most major credit cards, PayPal, or checks or money orders drawn on a U.S. bank. If you have a preference, let us know and we’ll make a note of it. If you would like to mail us a payment, you can do so at any time after approving the official estimate. We are happy to begin work on your book or Bible with no up-front payment in most cases, except for leathers that must be special ordered, mostly Sokoto goatskin and kangaroo. Click here to make a payment with a credit card. 2. What do you call that part of the book where … ? Don’t worry if you’re at a loss for words when describing your book. We can usually understand. But if you need a short glossary of terms, you can visit our blog post on the subject. Pictures always help, too. You can e-mail them to us. Click here to read our article about bookbinding lingo. Click here to send us an e-mail and attach pictures. Click here for a free quote, now that you know what it’s called. 3. Can I have the genealogical records from our Family Bible preserved? If the pages are becoming brittle and the edges are breaking off, of if the pages already have chunks missing, it’s sometimes better to have a good facsimile copy made and inserted before the information is lost for good. We can do this for you, and also make additional blank copies, all on acid-free archival quality paper, which will help you continue the tradition. We also now can make you a clear archival pocket, so you can keep the original in the Bible without fear of additional damage. Click here to visit our Family Bible Restoration page. Click here for a free quote to restore your family Bible. 4. Can I add some note pages to my Bible when it’s being rebound? Yes, we can add archival quality pages in the front and / or in the back, up to four sheets (eight writing surfaces) in each place. Click here for a free quote for rebinding with note pages added. Click here to go to our ordering information page, where you’ll find pricing information in Step One. 5. Can you turn a glued, paperback Bible into a sewn, leatherbound Bible? Well, that sounds like turning straw into gold. We can usually take a paperback Bible and give it a leather cover, but there are a few considerations. First, the paper used in a paperback Bible can be anything from a higher-quality paper to a cheap pulp paper. Obviously, we would get better results if the quality of the paper is better. Second, we do not stitch Bibles, but we do use a form of repair called cord insertion, where we insert glue-soaked binding cords into the spine edge of the text block at 45 degree angles, which strengthens and repairs it for the long haul. It works equally well on glued spines and spines with broken sewing. Finally, if your Bible has very little inside margin, or if you have made lots of notes there, you should understand that this repair does take up a little of the that margin space, though we try not to make the insertion too deep. We do want you to have a good, long-lasting relationship with your Bible, and if we can take your worn-out copy and give it a resurrection so that you’ll read it more often, we’ve succeeded. Click here for a quote to convert your Bible from a paper softcover to a leatherbound softcover. Click here to see our Bible rebinding categories and browse our leather recommendations. 6. Can you repair the tears on my bonded leather Bible cover? Bonded leather is a composite material made of sometimes as little 70% leather fibers (leather dust) and 30% “bonding agent.” Once it begins to disintegrate, it is not really repairable. We may be able to shore up a spine tear so that if used delicately your Bible will last till the recession is over, but we can’t resurrect this material. We generally would recommend a genuine leather replacement cover. Click here to see our page on why we use real leathers..
Click here to browse our various leathers. Click here for a free quote to rebind your Bible in genuine leather (or imitation leather / cloth). 7. Can you do wide yapps (extended edges) on a Bible? We can extend the edges of the new cover to about 3/8″ or 1/2″ at most, beyond the page edges (usually that would be a semi-yapp). We do not guarantee the exact measurements, nor whether the cover will fold down over the pages. This works better with some leathers than with others. Click here for a quote for a Bible rebinding with extended edges. Check out our 20th Century Sunday School Teachers Historical Style for a Bible with an extended yapp — and silk moire end pages, too! 8. Can you fix what my dog chewed up? How much did he swallow? Fortunately, most dogs like the covers better than the pages. They would rather feed on the leather than on the Word. Replacing the cover is not a problem. If we need to replace pages, we will look for a breaker copy of the same edition as your Bible in order to borrow pages and replace the chewed ones. The dog to the right is Arlo, winner of the 2012 Golden Doggie Award. 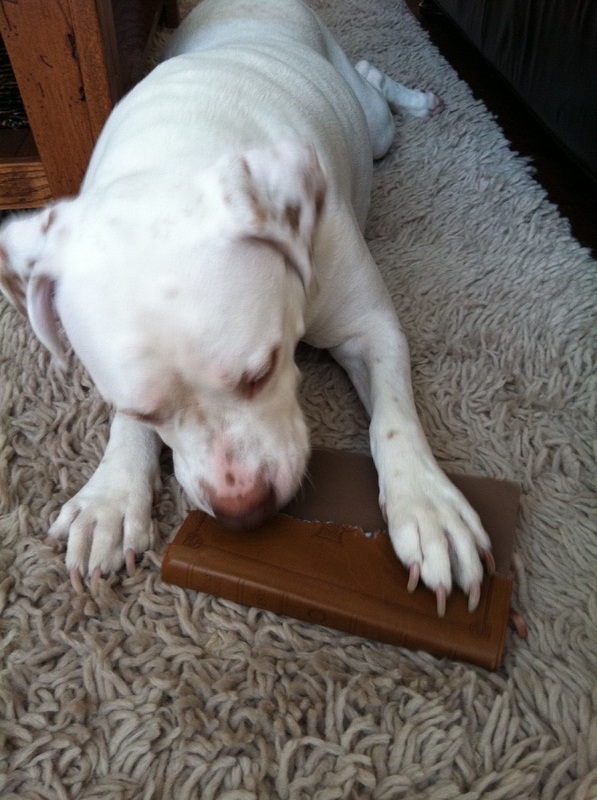 His owner actually caught him in the act of devouring a synthetic leather Bible cover. We love pets like this because their antics give us an opportunity to meet you. Arlo intended for his owner to upgrade the cover of his Bible, apparently. Click here for a free quote for repairing dog damage. Click here to submit your dog’s nomination for the Golden Doggie Award, for inflicting the most damage on a book or Bible without swallowing. 9. Can you do a rush job for my pastor? Yes, we love to help pastors and missionaries. A Bible is the tool of their trade, and we know how important it is to have their Bible back quickly. As much as possible, we will try to do a rush job for the pastor, but it needs to be with a leather we have in stock, not a hand-dyed product or specialty style, and hopefully not a special custom project with complex specifications. Click here to see what we can do for a Bible to repair it, or to rebind it with new leather. Click here to see what we would recommend for a pastor’s Bible. Click here to go directly to our ordering page. 10. What does it mean when a Bible has no copyright date? This means there was no reason for copyright the material. For Bibles, this would most likely be a King James or earlier translation, where the copyright has long expired and the text has become public domain. Click here for a quote to restore an older Bible. Click here to see our Historical Bible Rebinding styles. 11. Can you add some index tabs to my Bible? We do not drill the fore-edge of your Bible to index it, but if they’re the standard set of about 22 half-moon tabs, that all face front, and that are about 5/8″ tall, we can replace the ones you’ve lost. There’s a place in Indy that does drill them, and if you’d like, we can send your Bible there after we’ve rebound it. Click here for a quote to repair or rebind your Bible and replace the thumb tabs. Click here to find contact information for Ross Gage in Indianapolis. 12. Can I just have the spine replaced on a Bible? Click here to see some of our great leathers. Click here to see our “Ballpark Page” and get a general idea of what your project might cost. Click here for a free quote to rebind your softcover Bible or replace the spine on your hardcover Bible. 13. Do you have an actual store that I can shop in? You’re welcome to make an appointment and drop by if you would rather deliver your books than mail them, or if you’d like to feel and smell the leathers before making a decision. Note: Make sure to update your GPS before using it to find us in Burrows, or give us a call on your cell phone when you arrive here, and we’ll stand in the road and wave at you. Click here to see a Google map of our town and where we are, or to get our phone number to call us when you get to Burrows. Click here to e-mail us and make an appointment to come by. Click here for a free quote for your book or Bible repair or restoration project. 14. Can you make slip cases? It’s not our favorite thing to do, but yes, we can make slip cases for hardcover books, usually with cloth or imitation leather. We would need exact dimensions or the book in hand to do it. Here’s a link to an easy project order form, if you’d like to just go ahead and send us your book. Click here for a free quote to build a slip case for your hardcover book. 15. Can you duplicate fancy design work on the covers of books? Rarely can the original artwork be actually duplicated. But we do have some nice tools and can create something appropriate for the period, sometimes pretty close to the original. See our Facebook page for some recent projects we’ve completed. Here’s a link to an easy project order form, if you’d like to just go ahead and send us your book for a free evaluation. Click here for a free quote on restoring a book with a period look. 16. Do you have Highland Goatskin? We do not have Highland goatskin, but we do have a good selection of soft-tanned, natural grained goatskins that are both soft and flexible. We also have a leather-lined goatskin style, and we have a some natural wild grain Sokoto goatskins. Click here for a free quote to rebind your Bible in soft-tanned premium goatskin or a Sokoto goatskin. Click here to see the standard price list for Bible rebinding. Click here to read more about our leather-lined goatskin style. 17. Do you offer leather liners? We use standard leatherette as end pages when we rebind a Bible. However, we do have one leather-lined specialty style, made with River Grain goatskin, lined on the inside with genuine lambskin. Click here to see our Leather-Lined River Grain Goatskin style. Click here to see the price list for the leather-lined River Grain goatskin specialty style. 18. Can you do a cover with a snap or a zipper? We don’t do zippers and have no snap option at present. However, we have a specialty style — the 19th Century Circuit Rider Historical Style — that has a tab closure. You may want to look into that. Check out the tab closure on our 19th Century Circuit Rider style. Click here to see the price list for all our Historical Styles, including the Circuit Rider. 19. Can I reprint your articles on my website or blog? Yes, you may reprint them with credit given and a link to our home page. We would encourage that. Let us know if you do. Click here to write us about your link. 20. Are you related to Haley’s Lock and Key in Lafayette? No. They are the Irish Haley’s and we are the English Haley’s. Click here to write Eric about genealogy, especially if you’re a long lost relative. You can also visit our favorite links page for other resources.